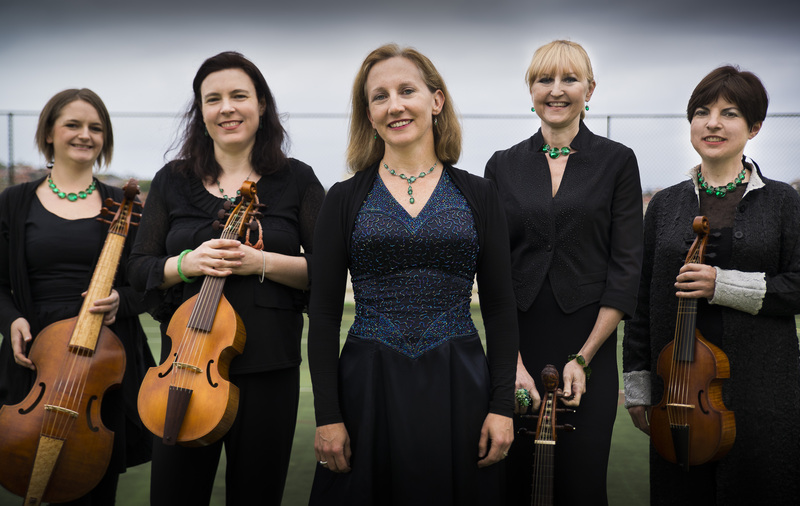 Once again Josie and the Emeralds promise to surprise and delight with their annual Saint Cecilia‘s Day concert as part of the Glebe Music Festival. Sparkling gems by Lassus and Handel in praise of The Patron Saint of Music are placed alongside thought provoking contemporary premieres. This year the acclaimed soprano and viol consort will be joined by the mellow tones of the marimba and the double bass. The haunting blend of marimba and strings is incorporated in a new arrangement by Brooke Green of Purcell’s “Hear the Deities”. There is a moving response to the Syrian refugee crisis with Brooke Green’s “Perfumed with Blood”. The marimba, viols and double bass are also part of the sound world for Jacques Emery with his songs inspired by the surreal poetry of e.e.cummings. Tickets at door: $35, concessions $25. 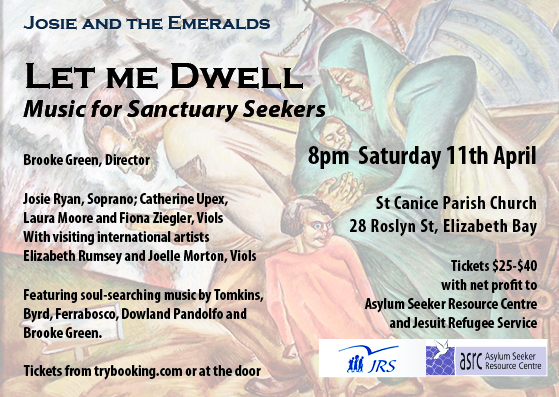 A fundraiser for the Asylum Seekers Resource Centre and the Jesuit Refugee Service. Net profits from ticket sales will be given to these two wonderful organisations. Music by Tomkins, Byrd, Ferrabosco, Dowland, Pandolfo and Brooke Green. This programme features music that was written by composers facing war, repression, religious intolerance and oppression – the circumstances which still today force people to seek safety and refuge in far away places. We begin the program with John Jenkins’ Siege of Newark. During the English Civil War, the town of Newark was besieged three times, the third siege lasting six months with the townspeople suffering starvation and plague. In 1649, Thomas Tomkins composed A Sad Paven for these distracted times lamenting the execution of Charles I and the horrors of the Civil War. Religion was a burning political issue in Elizabethan and Jacobean England; failure to conform often resulted in penalties ranging from career stagnation to death. Under Elizabeth, Catholic composers had to tread warily but despite the dangers some were still bold enough to take calculated risks. Included in this programme is William Byrd’s Why do I use my paper, ink and pen? This epitaph for Edmund Campion, martyred in 1581 was a dangerously outspoken protest against Elizabeth I’s hardline stance towards politically overt Catholics. At this time John Dowland (1562-1626) converted to Catholicism while realising it made himself ineligible for a court position under Elizabeth. His Semper dolens, semper Dowland is a meditation upon melancholy. Granted, melancholy was a fashionable conceit and the title is a clever pun upon his name but its sombre mood cannot help but convey difficult times. We also perform Dowland’s claustrophobic In darkness Let me Dwell, where the subject is imprisoned in a metaphorical hell. Orlando Gibbons’ What is our life? is set to a philosophical text by the notorious Sir Walter Raleigh, twice sent to the Tower of London and eventually executed by James I to appease the Spanish. The forebears of the important viol consort composer Thomas Lupo, ostensibly Venetian were almost certainly Sephardic Jews fleeing from The Spanish Inquisition. Thomas’s grandfather, Ambrose was one of a number of Venetian musicians brought to England by Henry VIII to improve the standard of English music of the time. 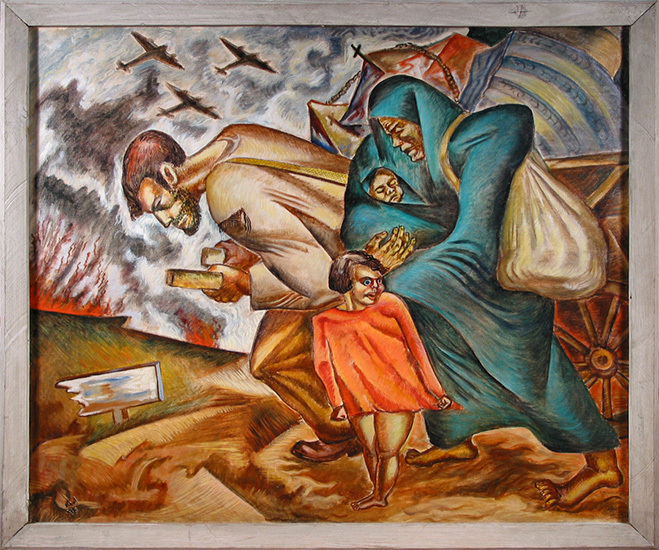 Our programme also includes more recent works: Albanese – the lament of a refugee mother by Andrea Pandolfo and two songs by Brooke Green based on the searing poetry of Dorothy Porter: The Flashing Mountain and Spears.